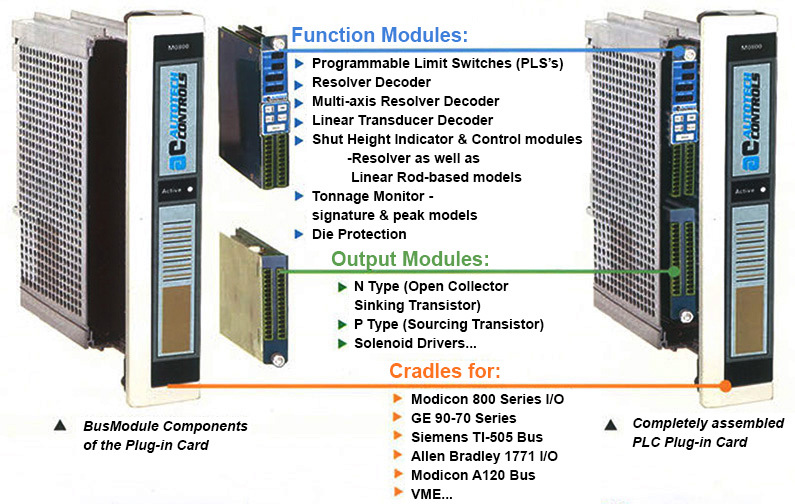 Plug-in PLS Modules for Allen Bradley 1771 I/O, GE Fanuc 9070 and Siemens TI-505 PLCs. AVG Automation has continuously set the standard for speed, precision, reliability, and product features in the resolver decoder and programmable limit switch (PLS) marketplaces. In the past, to implement such functions, the user purchased a stand-alone Resolver Decoder or PLS, and connected it to the machine. With the advent of the programmable logic controller (PLC), users now want to integrate such functionality with their PLCs. Also, users don't want to tie-up their PLC's CPU with the necessity of performing all the data processing, calculation, signal conditioning, and scaling of a resolver's input in order to implement motion control actions. Now, users of Allen-Bradley 1771 1/0, GE Fanuc 9070 VMEbus, and Siemens TI-505 PLCs can simply plug such functionality directly into their PLCs-forever freeing the PLC's CPU to perform other control functions. Please Note: User of Modicon PLCs may refer to our ModConnect product catalog for plug-in modules. The M8251-010 and M8251-F10 PLS Modules combine 16 outputs; fault detection and indication; 8 user-defined PLS setups; and simple, easy-to-learn programming in one compact module that easily plug directly into a slot of the PLC. If the user programs the setpoints for each channel using the front panel keys, each of the eight PLS setups supports up to 160 ON/OFF setpoint pairs that may be used in any combination of 80 each of the LOW and HIGH eight channels. When the programming is accomplished via the PLC backplane, there are only 112 ON/OFF setpoint pairs available. These may be used in any combination of 56 each on the LOW and HIGH eight channels. Also included are a fault output and a motion detector that energize when the resolver is rotating between motion limits. Long, complex key sequences are a thing of the past. With the five self-explanatory programming keys, programming the PLS is extremely simple. Most programmed values can be adjusted with the machine running, making fine-tuning of job parameters easy. To avoid unauthorized setpoint and setup changes, setting the Program Enable (PE) FALSE prevents tampering. The PLS can store up to 8 independent, user-defined PLS setups for different jobs. The unit can accept either a front panel entered, PLC backplane command, or a serial link input command to select a particular, stored setup.